Ninja Fruits, a Japanese-themed online video slot in the PlayNGo portfolio, is rich in features such as free spins, bonus games, and a top jackpot of 5,000 coins. 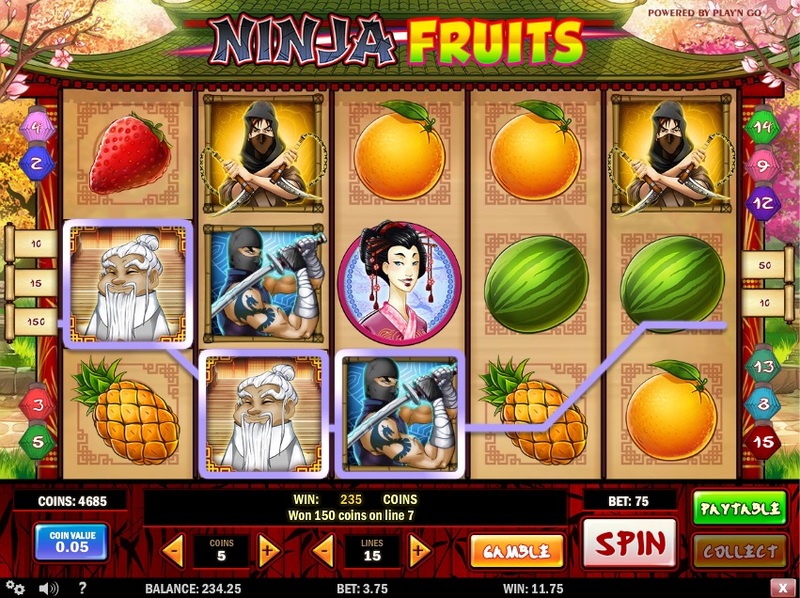 Ninja Fruits is a simple slot based on standard slots rules. Players should first select the number of paylines they would like to activate by clicking on the plus and minus signs on the Lines button. The slot allows a maximum bet of five coins per active payline. The coin values range from $0.01 to $0.25, which means that players can bet a minimum of $0.01 and a maximum of $18.75 per spin of the reels, which is not that bad considering the fact that the slot offers a top fixed jackpot of 5,000 coins. To make things more exciting than ever, the slot comes with an Autoplay feature, which players can use if they do not want to spin the reels manually. Players can also click on the settings option to customize their gaming experience as they wish. Ninja Fruits is PlayNGo’s attempt to mix the Japanese theme with that of fruits. As a result, players have a beautiful fruity slot set in natural surroundings. The reels feature ninjas, plums pineapples, and strawberries, all of which create a delicious slot gaming experience. The graphics, though a bit cartoonish, can entertain players no end especially when they get animated in winning combinations. Players will definitely enjoy spinning the reels of Ninja Fruits. The wild Ninja Master symbol helps players finish winning combinations by substituting for all other symbols except the bonus symbol. Players can take home the top fixed jackpot of 5,000 coins by landing a combination of five Ninja Master symbols along an active payline. The bonus symbol is the Shuriken, which appears only on the third, fourth, and fifth reels. If players get a Shuriken each on these reels, the Hit the Fruits Bonus Game gets activated. This game challenges players to throw a shuriken at various fruits and hit them to win amazing prizes. However, it comes to an end if players miss the fruits. Players can win up to 150 coins in the bonus game. Players can not only activate the free spins round, but also win 5 coins by landing three Geisha scatter symbols anywhere on the reels. An extra scatter symbol is added onto the reels during the free spins round. The Geisha spins her umbrella and the symbol it shows when it comes to rest acts as the extra scatter. She then opens her fan to show players exactly how many free spins they have won. The slot also has an optional gamble feature. The slot is available for fun or real money play at any online casino that offers PlayNGo games.